Sitting it out in Wadi Halfa,Sudan, is like spending 3 days in a Sauna with nothing but your thumbs to twiddle…There is NOTHING to do here except eat, sleep and sit in a steel container that has been converted into an internet cafe that exacerbates the heat. There are a few places to eat in Wadi Halfa but really only one that looks “semi trustable”. We spend a lot of our time hanging around there like bar flies (except this is no bar..have I mentioned that I would give my left arm for a cold beer?) because I cant stipulate this enough..there is NOTHING to do here but wait!!! Wadi Halfa at the very least becomes a little interesting within the 2 days before the ferry departure because the town fills up with overland travellers getting onto the ferry to Egypt. We have met a few fellow travellers yesterday and today which make the days more bearable to get through. Marcus, a Canadian that is making his way around the world on a Kawasaki KLR650 has now been on the road for 13 months, has traversed 70,000km through North and South America and is completing Africa on a similar route we have taken these last 2 months. His 13 months make us look like novices!! We have also met another South African and a German travelling in 4×4’s heading in the same direction as us. 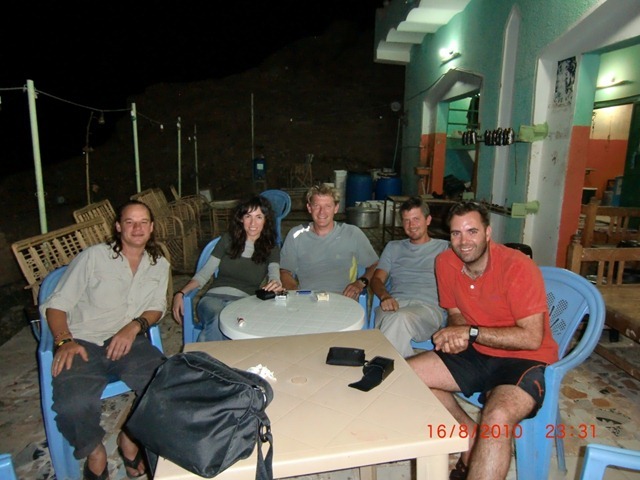 It is interesting but in swapping stories it seems that we have been either a day behind or ahead of each other for the last 6 weeks yet the first time we have met Marcus,Rudy and Andrea is in Wadi Halfa. Insofar as the mileage of our trip is concerned, the original estimate when adding the various routes showed it to be 12,750km, however, we still have approximately 1300km to do until Cairo and my bike speedometre is already reading 13,033km travelled since Cape Town. Grindrod Bank have very kindly agreed to cover the additional mileage with their donation to MaAfrikka Tikkun of R10 per kilometre. Fellow travellers on the road.